Love Pop Ups London went along and played OperationBlackSheep in a top secret location. In OperationBlackSheep Professor BlackSheep, Mr Q’s arch nemesis has been scheming and plotting against the agency and the whole of mankind. The Professor has built and launched a satellite into Earth’s orbit, capable of controlling all human minds. The team will has been sent behind enemy lines with the mission to infiltrate into the Professor’s command center, hack into his system and obtain the missile codes in order to destroy the satellite once and for all. However by launching the missile into the satellite will trigger the command center’s self-destruct sequence. The team will just have 60 Minutes to destroy the satellite until it goes online and evacuate the command center before it self-destructs. It was up to Love Pop Ups – London team to complete the mission. Thanks to clueQuest who let some of us from the community of Love Pop Ups London come down to experience a fun and challenging escape room OperationBlackSheep. Read all blogs/reviews from the comments section below. My second visit to clueQuest to continue the story of world destruction! Today’s escape room had a mixed of number puzzles and some fun physical games and puzzles. It’s always nice to have something tactile to play and move during a game. The rooms were spacious as well, I never felt claustrophobic. We didn’t need much help, only getting two clues along the way, so generally things were pretty easy and simple to figure out. My group has also done a few escape rooms now, so we have gotten used to getting into the puzzle solving mid-set!. Everything in the room was new and well crafted- almost too much so, like it had been mass produced. I’ve really started liking the more homemade style of smaller escape rooms, calling back to their origins. Overall I liked this room at clueQuest and would say it’s great for beginners who have never tried out an escape room and want something safe and fun to try! Thanks to clueQuest and LovePopUpsLondon.com for the invite! This is a great place to do an Escape room, the team are very friendly and happy to help if you have any questions. The theme of the game comes through from the very start as you step inside the venue, they incorporate it within the brief and the room is also themed in the same way, its very clear on the mission you have to complete and you dont necessary have to complete one task to get to another however it dose help if you do follow the basic order the game sends you in. The game was full of lots different clues, puzzles and different style locks etc, its a good range of diversity for a group of friends or a team building exercise and always helpful to have people with different skill sets in each team. I really enjoyed OperationBlackSheep and i have also done PLAN52 both i would say were on the same level of difficulty, they do offer another one which is Revenge of the Black Sheep I have not tried this one yet so I do not know how much harder it is but apparently it is more of a challenge. Thanks to clueQuest and love London Pop ups for the experience. This time I had the opportunity to try their 2nd room OperationBlackSheep and it was even better than the 1st one. You can see they have learned from the somewhat imperfections of their 1st room (not that there were much). The game flows better and each puzzles requires various types of skills which is great as everyone in your team will have the opportunity to shine! Went back to clueQuest for Operation BlackSheep and found it as delightful as the first time I went for Plan52. I like the fact that the theme of the game comes through in various elements. The game was full of clues, puzzles, elaborate set-ups that are really cool, but I think what I like about it is that it wasn’t frustrating. Our agent, Far (as he is called) offered us a clue right away but didn’t obligate us to take his clue when he found us getting stuck. He told us we were doing well so he gave us the choice whether to take it or not. The clue ended up being one that we needed because we collectively don’t think we would have figured out what we needed to do next if he didn’t give that clue. The thing about clueQuest is that it is very well organized, and the rooms are carefully designed. There is always enough to do so everyone seems to be involved. I think there will always be something that you haven’t seen before, and this is always very welcome as it adds to the experience. I would definitely recommend! Having completed PLAN52 recently (and being thoroughly impressed) I couldn’t wait to go back and try clueQuest’s second escape game; OperationBlackSheep. The same friendly and enthusiastic staff greeted us and patiently waited for a few stragglers (weather causing all sorts of public transport issues). Without giving anything away this next game was even better. Once again fighting crime against Mr Q’s arch nemesis Professor BlackSheep but this time trying to stop a satellite that has the ability to control minds from PBS command centre with only 60 minutes until the command centre self-destructs. After getting over our one big over sight we methodically worked our way through each puzzle. There were plenty of puzzles to get your teeth in to, requiring varied different talents. And again the specially designed contents and decor were awesome. Luckily for you all we saved the day with 10 minutes to spare! clueQuest has 3 identical units so it is perfect for team outings with a little competitive streak. 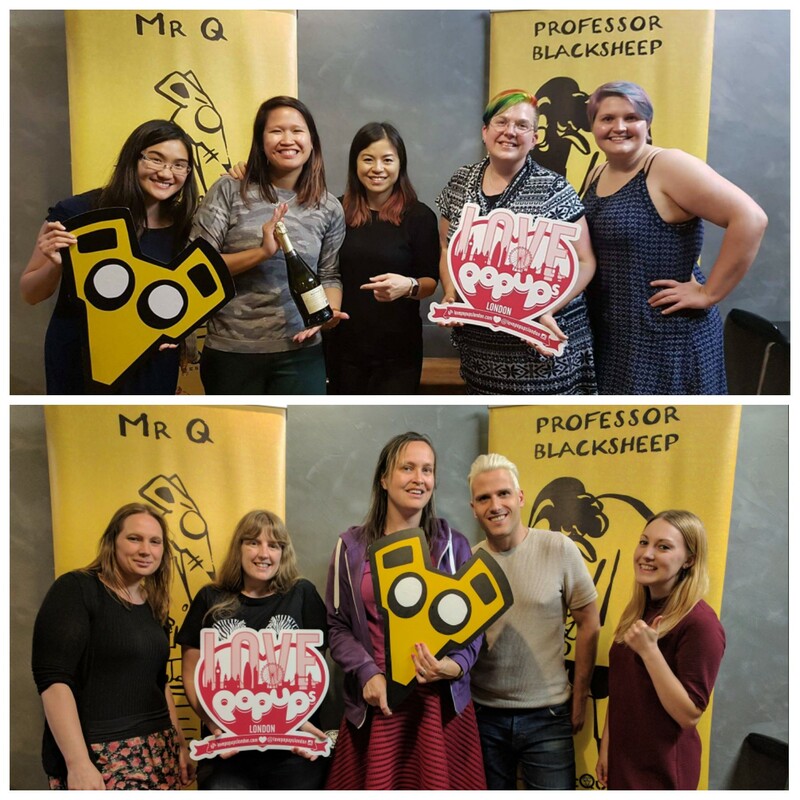 Our team had a blast competing against another so a massive thank you to Love Pop Ups London and clueQuest for organising. Looking forward to completing their last game; Revenge of the Sheep. Operation Blacksheep is an excellent and fun escape room. Great and funny story, very nice decor. Always some puzzle to solve, no time to get bored and we never felt like we were stuck at any point. Some puzzles really forced us to work as a team, which is in my opinion on of the best parts of escape rooms! Far was the person taking care of us and he was fantastic, he even found great agent names for us (I was Agent Unicorn)! I loved solving problems with my Rainbow Brigade team. We all had so much fun and found the storyline very interesting and appreciated the humour! Returned to clueQuest to play OperationBlackSheep and once again had so much fun working together with my team to crack all of the clues in order to stop the evil Professor BlackSheep from controlling all human minds!